Although I’ve talked a lot about BH5 and what I’ve done there, I’ve never really broken out a formal “Upgrade Guide” like I did with BH6. So, without further ado…here’s my BH5 Upgrade Guide! BH5 adds more fun, especially in the troop department. In a lot of ways, I really think the game becomes fun at BH5 and a lot of that is because you finally get your Battle Machine. Your new troop at BH5 is the Cannon Cart, but, to be completely honest, it’s not very useful. I’ve actually forgotten to upgrade the Barracks and I don’t upgrade the Cannon Cart in the lab at all. Right away, your initial focus needs to be getting the new defenses on the game grid. This is always the case when upgrading your BH because the new defenses will put you ahead of those you left behind at the previous BH level. The priorities here - the Battle Machine and the MultiMortar. Ideally, you raided like mad while awaiting the BH upgrade completion and already have the resources you need to get the new storages so you can put these on the board early. This is also a standard step for my games - I upgrade anything new to match their counterparts from the previous level. In the case of BH5, it’s the cheap things that get the royal treatment here - resource collectors and storages, traps, and walls. 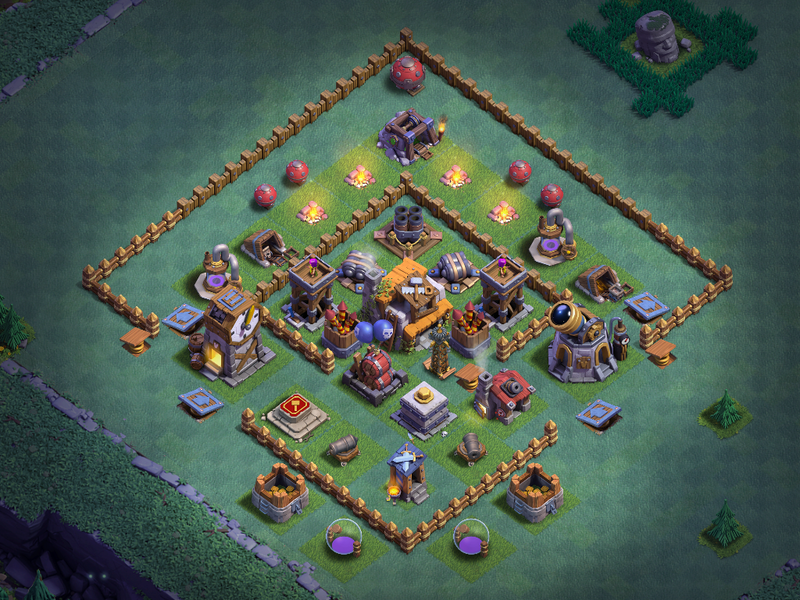 Prioritize storages initially - you need them early on for the Battle Machine, MultiMortar, and troop upgrades. One of your new BH priorities should also be getting the Star Laboratory upgraded as soon as you have enough elixir saved up to do so. Ideally, this will be just a day or two after you've upgraded. This is important because you want to be working on troops as soon as possible. 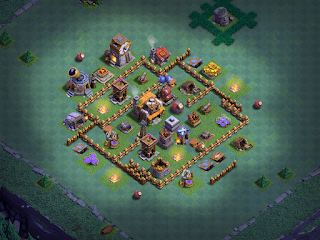 Level 10 troops at BH5 make a huge difference in your attacking capabilities. Step 3 - Shore up air defense. The game meta strongly favors air at BH5, so I start there on the upgrade path. First, get the FireCrackers to level 5 followed by the AirBombs. Once they are done, move on to your Archer Towers. In between, hit things like mines and traps. Step 4 - Strengthen ground defenses. Once your air defenses and Archer Towers are solid, move on to what's going to hurt your opponent's ground strategy most - the Double Cannons. These are particularly effective against the Battle Machine. Next up, get the Hidden Tesla to level 5 followed by the Cannons, and, finally the MultiMortar. Sometimes, I run the Hidden Tesla before the Double Cannons; it just depends on where I’m at in cups. If I’m seeing a lot of air attacks, I like giving my Tesla a little extra juice to beat back the Baby Dragons. Step 5 - Everything else. Once all these are done, THEN I would hit the Guard Post, Barracks, Clock Tower, and Gem Mine. At BH5, your best troops are Beta Minions and Baby Dragons. Mass Beta Minion and Mass Baby Dragon are very common attack strategies for BH5 players. They work and they work well. Getting these maxed for when you start seeing BH6 players is even more important. Their real strength isn't just in the additional HP - nearly every troop upgrade at BH5 increases what you can carry in your Army Camp! That leaves the question of when to upgrade the Battle Machine. The Battle Machine doesn’t really become any more useful as a troop until it gets its ability at level 5. Levels 2 thru 5, costs you 4.6M elixir; your trophy level is still pretty low, so that means you'll be taking weeks of daily raids under the loot cap just pushing to level 5. It's much better to upgrade key troops - namely Beta Minions and Baby Dragons. Three F2P games in and I left the Battle Machine upgrade to almost the very end of my elixir-based upgrades on all three. I’ll be doing the same on my three brand new BH5 games as well. There are a lot of base designs out there that you can choose from. I use 2 - one that’s an interim base until I get the Battle Machine, and then my standard diamond base when I get the MultiMortar. (Sometimes I’ll use the diamond base right away and just put the Gold Storages where the Battle Machine Altar and MultiMortar go.) Here are the two bases; you can see in the pic below where I’ve moved the Star Laboratory and Clock Tower over to accommodate the Battle Machine Altar on my interim base. This is yet another hotly debated topic. My guides are written for players who are either near-maxing or cautiously rushing to the next level of the BB. As such, I encourage maxing as much as you can before pulling the pin on the next BH upgrade. 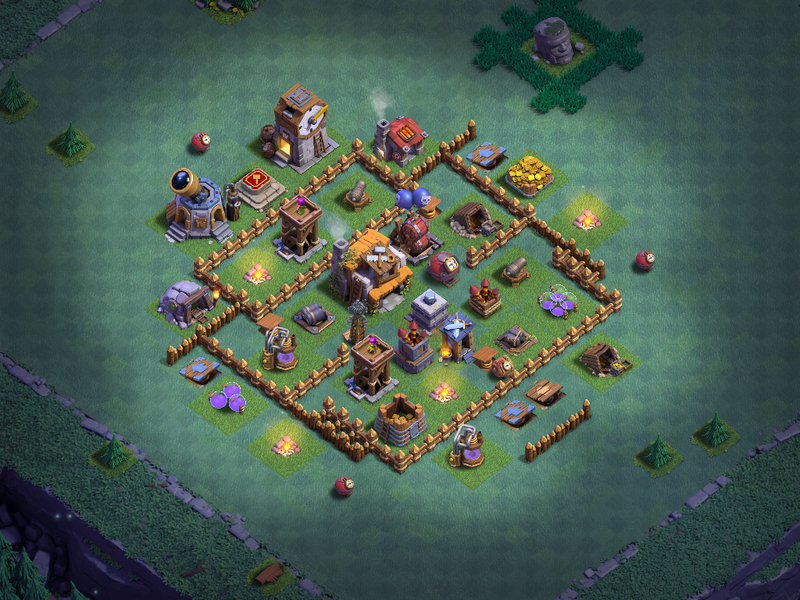 On my games, I max all of my defenses and resource buildings, as well as most troops, then I upgrade. 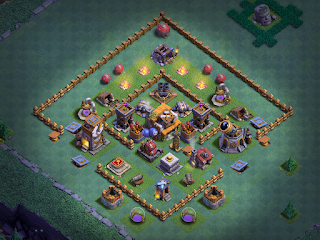 If possible, I will max everything except walls but I won't wait to max if it means wasting resources. For example, if I have all of my troops to their max for a level except something like Bombers (which I don't often use), and my attacks the next day will fill storages with nothing to use the gold on...I'll start the upgrade the next day and catch up on Bombers later. The time you spend at BH5 will largely depend upon how quickly your game advances through the trophy levels. An early BH5 will find itself around 1800 trophies; late BH5 is typically closer to 2600 trophies. There's a big difference in the daily loot cap there and that will determine your pace. Make the jump to BH6 when you're comfortable doing so. So long as all of your defenses are at least level 4, Beta Minions and Baby Dragons are level 10, and your Battle Machine is level 5, you'll be able to compete at BH6. (If you want to rule at early BH6, take those defenses to level 5, max the Battle Machine, and get all of your troops to level 10). So there’s my guide to laying out your brand new, level 5 Builder’s Hall. I’ve done this now on 7 games (soon to be 8) and although I might switch one or two things up along the way, this is the way I run, start to finish. Hope you find it helpful!